Meat products and charcuterie require special storage and distribution conditions. 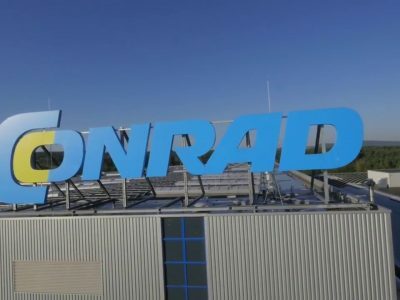 One of the biggest Polish companies in the meat industry has decided to implement an automated warehouse for boxes and pallets. Its task is to ensure easier storage and order preparation. 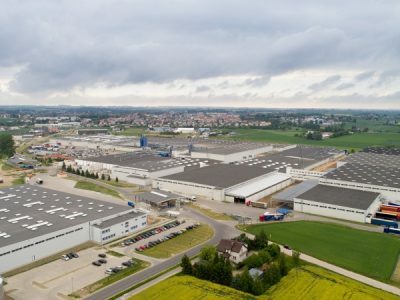 The decision to automate the logistics centre of ZM Henryk Kania company was taken when it turned out that the existing centre was too small and the preparation of orders was not sufficiently effective and smooth. 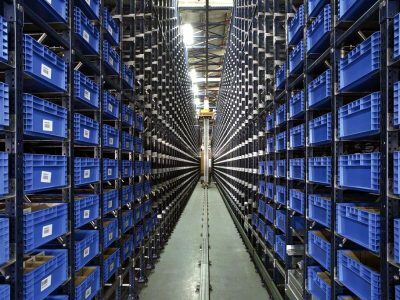 It was assumed that the new logistics centre equipped with an automated storage system would meet the current and future needs of the company in the area of logistics. Due to the specific nature of the products stored, the company implemented the automated warehouse for boxes and pallets with the equipment providing communication between the production zone, the zone of manual order picking and the warehouse management system Easy WMS. The system controls all the processes taking place in the installation (from the entry of the products to the warehouse until the delivery to the customer). The packing lines are the last part of the production chain. This is where the control over the products is taken by the machines. 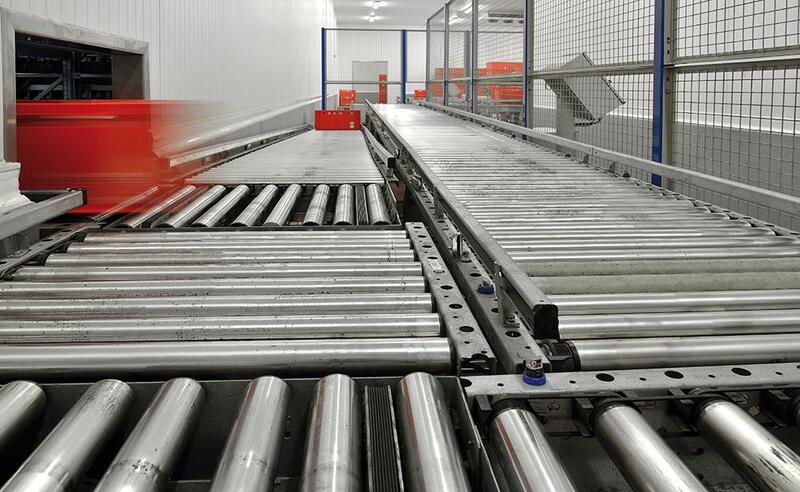 The packing stations are connected with the rest of the warehouse through a double line of automated conveyors: one of the lines returns empty boxes to the packing zone, while the other transports full boxes to the warehouse. The boxes are filled in at the end of each line or directly on the non-automated (driven under gravity) conveyor, which may also function as a preparation table. The continuous conveyor runs parallel, carrying the completed boxes. 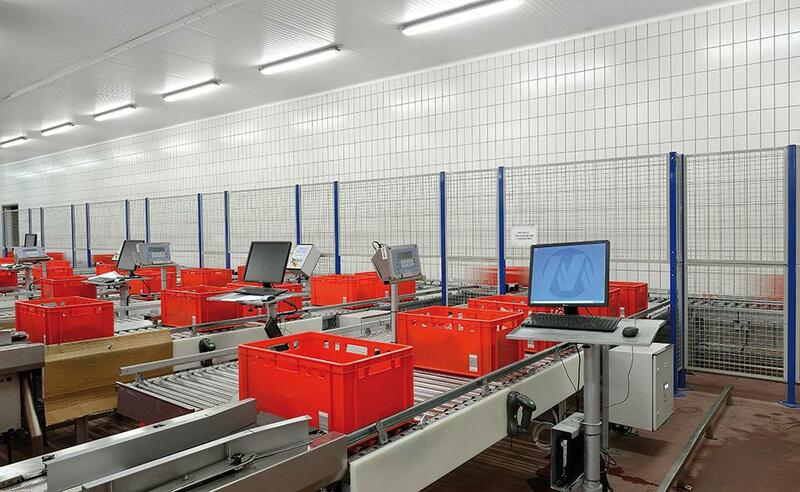 The processes in the zones connecting the packing lines with the conveyors are controlled by Easy WMS software. Its task is to remember data regarding all the products placed in the boxes and store these data until the moment of issuing the goods. The same lines are used for transporting boxes inside the warehouse and to the manual order picking zone. To guarantee safety, the continuous conveyors are secured with metal mesh. As there is a possibility of accumulation of a large number of boxes for storage, the system can give a priority to certain boxes waiting for order picking. The warehouse part has been divided into two refrigeration zones. The larger one is used to store boxes with prepared products, while the smaller one contains pallets with orders which are not intended for distribution immediately after the completion of the processing. The automated warehouse for boxes consists of six aisles with 8.7 m high double-deep racks on both sides. Each rack consists of 47 17-level units and two 14-level units. The total capacity of the warehouse is equal to 19,848 boxes, and the maximum box payload is 35 kg (which amounts to 694,680 kg). 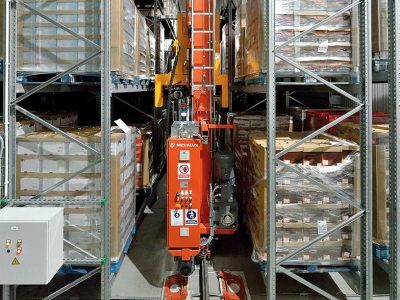 Miniload stacker cranes, equipped with a double deep extracting mechanism, run along the aisles. They can be used for two boxes at the same time, both in the entry and exit zones (order picking and box processing stations are adapted to allow two boxes simultaneously). The aisle entries are equipped with secure gateways which cut the power to the stacker crane after opening. The automated pallet warehouse consists of one aisle with a stacker crane processing pallets with products ready for dispatch. Both the entries and exits are supported by one conveyer which is located in the side section of the manual order picking zone, close to the reception station for empty boxes. The conveyor connects the warehouse with the common area next to the loading ramps. At this stage, the order of operations (entry/exit) is supervised by the employee, however, the next stages are fully automated. The pallet warehouse contains 288 pallets. The maximum pallet load is 700 kg. Manual order picking is conducted with the use of eight stations with two conveyors which can transport up to six boxes at a time. The company has implemented special solutions to ensure availability of free spaces during the continuous rotation of the boxes. The empty boxes which are not used in a given moment can be stored in the warehouse, on the pallets or in another place specifically adapted for this purpose, and then sent to the packing zone.